As women across the country link their ovarian cancer to long-term use of Baby Powder and other feminine hygiene products containing talc, manufacturer Johnson & Johnson (J&J) faces a growing number of talcum powder lawsuits. In early 2016, J&J got hit with a $72 million jury verdict connected to the death of a long-term baby powder user. Such a large award could precede talc settlements in other J&J lawsuits. Many women use baby powder in their daily cleansing routine by sprinkling into their undergarments to reduce odors and absorb moisture. Studies indicate that using talc-based products in the genital area may allow particles to enter the body and travel through the cervix to the ovaries. From there, the product can cause chronic inflammation that may encourage the growth of cancer cells. In late February 2016, a Missouri jury awarded the family of the late Jacqueline Fox $72 million in her talc lawsuit. It was the first time a jury had awarded a plaintiff damages for a talc powder injury. Fox passed away from cancer in October 2015, at the age of 62, after having used J&J’s baby powder and Shower to Shower for hygiene for over 35 years. The Birmingham, Alabama native sued J&J after she was diagnosed with cancer and died about two years later. Fox’s son carried the case on after her death and after a three-week trial, the jury took only four hours to decide that J&J was liable. Fox’s lawsuit alleged that J&J concealed knowledge that its talc products could lead to cancer. Key evidence included an internal company memo in which the company blamed growing public knowledge of the cancer link for plummeting product sales, something the company had never disclosed to customers or regulators. The memo callously then suggested ramping up marketing of its talc products in black and Hispanic communities where they are more often used. Ms. Fox was an African-American woman. The jury ultimately held J&J liable on several counts, including fraud, conspiracy, and negligence. The first $10 million of its award represented its finding of actual damages. The additional $62 million constituted punitive damages to deter future cover-ups. Before Jacqueline Fox became the first plaintiff to be awarded damages in a baby powder cancer lawsuit, Deane Berg, a 58-year-old physician’s assistant from Sioux Falls, SD, was the first plaintiff to win a verdict that J&J was negligent. Berg developed symptoms of ovarian cancer in the fall of 2006 at the age of 49. After her family physician gave her a clean bill of health, she went for a second opinion and was diagnosed with stage 3 ovarian cancer. She underwent removal of both ovaries and a full hysterectomy and was given less than five years to live. Berg got ready to start six months of chemotherapy and while reading literature from her oncologist, discovered that talcum powder had been linked to the development of ovarian cancer. The only cancer risk factor Berg had was daily use of Baby Powder and Shower to Shower for feminine hygiene. In 2013, Berg sued Johnson & Johnson and turned down a $1.3 million settlement offer because she would not agree to sign a confidentiality clause. Her case ultimately went before a jury in the conservative state and it found J&J had acted negligently but awarded her zero damages. However, it was not about the money to Berg anyway; it was about the chance to tell her story and warn other women. She believes Johnson & Johnson’s Baby Powder and Shower to Shower products should be removed from the market and, until that happens, display a warning about the risk of cancer. She sees her role as important because she set the stage for other women to file lawsuits to hold the company accountable. Talcum powder lawsuits are relatively new but growing now that cases like Deane Berg’s has paved the way by bringing manufacturer negligence to public attention. Plaintiffs in states across the nation have emerged and as more lawsuits are filed, the federal courts may form a multidistrict litigation (MDL). MDL proceedings are common in product defect and dangerous drug litigation because there are many overlaps between individual cases – the plaintiffs make the same or similar claims against the manufacturer or distributor and they often suffer similar injuries. 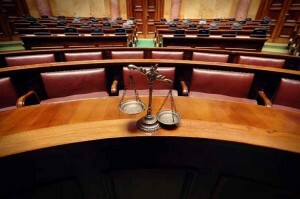 By forming an MDL proceeding, a single judge can make consistent rulings across many lawsuits and facilitate discussions among the various parties. An MDL can lead to large settlements because one judge has the opportunity to encourage cooperation among many lawsuits. The proceedings also allow the parties to select a small number of test cases to be tried first in what are referred to as bellwether trials. The outcomes of these early trials give the parties clues about how juries respond to their arguments. It is common for many cases to settle after one or several bellwether trials.